2017 is over, but we’re just getting started. I’m not usually the biggest fan of conversations over general rankings (my yearly power rankings aside), but I do find them most useful years later, when I’m trying to remember what I thought of the filmgoing landscape with some perspective. That’s why I do rankings, period, and it’s triple effective when I get to hear Top 10s from my Cinemaholics cohosts. 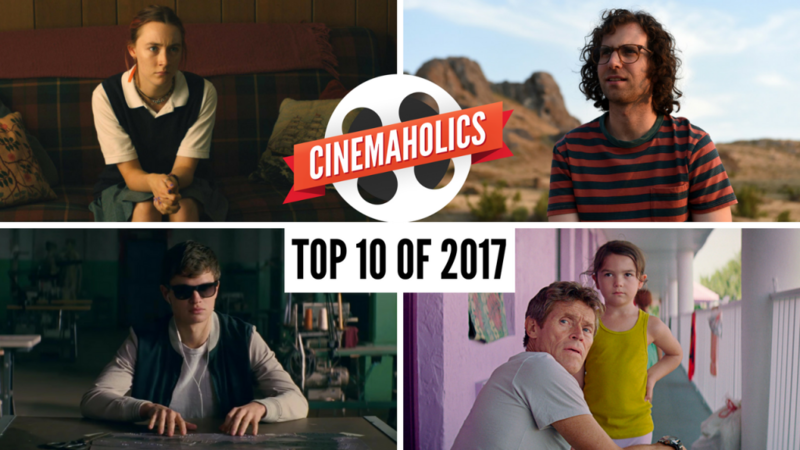 Our lists do feature some expected overlap, including a clear Cinemaholics “winner,” if you want to call it that. Turns out Brigsby Bear had the most collective impact on me, Will Ashton, and Maveryke Hines, and hopefully some of you awesome listeners. Enjoy the episode, and if you just can’t wait, here are our Top 10 lists written out below. 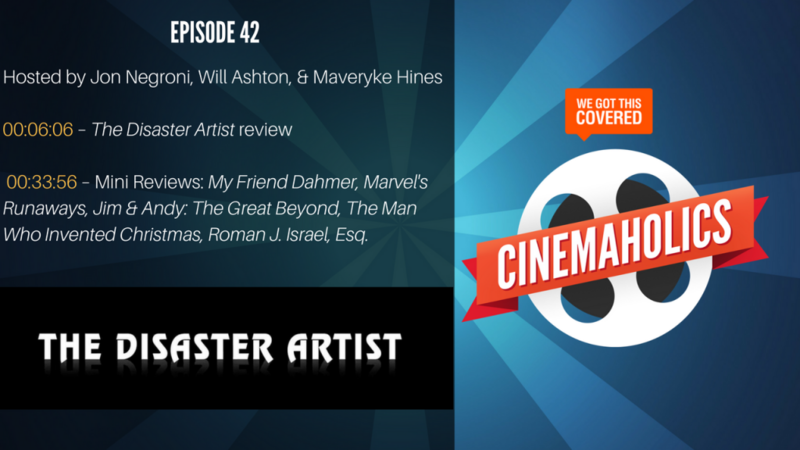 On this week’s podcast, I’m joined by Will Ashton and Maveryke Hines to review The Disaster Artist, along with a lot of other new releases we saw this week like Marvel’s Runaways and The Man Who Invented Christmas. Starring James Franco and his brother Dave Franco, The Disaster Artist (which Franco also directed) is a new film from A24 about the making of The Room, known to many as perhaps the “best worst” movie ever made. The film is getting a ton of love from audiences and critics alike, so naturally, we had a great discussion on what we think of the Oscar contender. 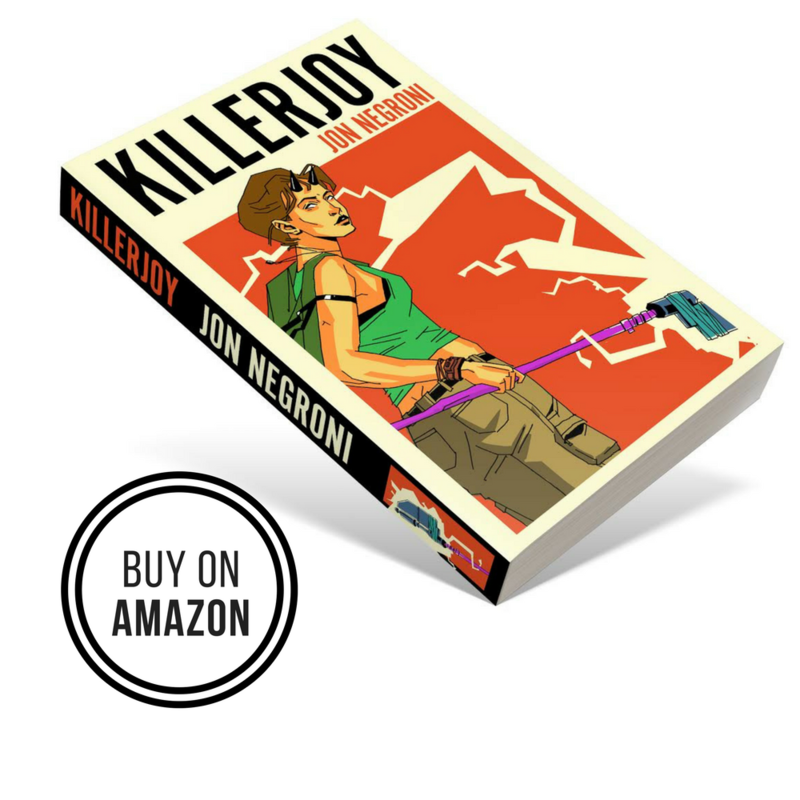 The rest of the show is devoted to a slew of Mini Reviews, from a new documentary about Jim Carrey and Andy Kaufman on Netflix to the Nightcrawler writer/director’s follow up film starring Denzel Washington. Plus a few more surprises. 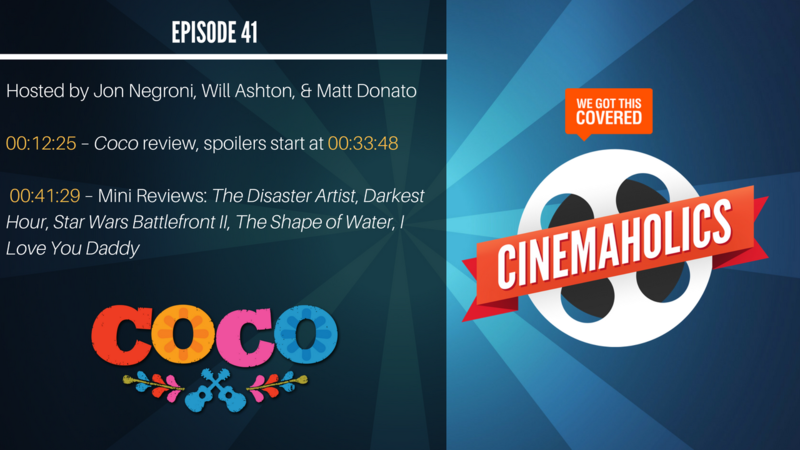 Coco is yet another major success for Pixar both critically and financially, and over Thanksgiving break we took some time on the podcast to review the film with special guest Matt Donato. We started the show with some discussion over the recent John Lasseter scandal and how that might affect (or have affected) the production of Toy Story 4. And we did find time to get into some spoilers for Coco with proper warning, of course. In our packed Mini Review segment, Will Ashton and Matt Donato spoke at length about The Disaster Artist, the new A24 film starring James Franco, Dave Franco, and Seth Rogen. Will had a chance to finally share his thoughts on Darkest Hour, which is set to secure Gary Oldman an Oscar nomination for his portrayal of Winston Churchill. I managed to sneak in my thoughts on Star Wars Battlefront II, pointing out how some plot details in the campaign may pave the way for details in the upcoming movies. Lastly, Donato discussed his spontaneous thoughts on I Love You Daddy, the Louis C.K. film that has been dropped by the distributor, as well as The Shape of Water, Guillermo del Toro’s latest film being both praised and ostracized for its polarizing material.